American Idol 2014 winner was crowned Wednesday night, May 21 (May 22 morning MLA time). 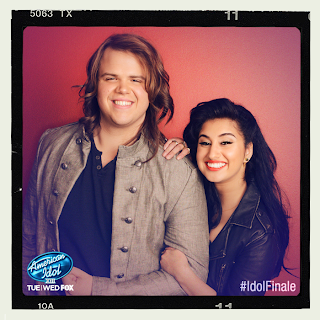 Who between Caleb Johnson and Jena Irene won as 'American Idol' Season 13 (2014) winner? Both Caleb and Jena impressed the judges and the viewers during their 3-round finale performances yesterday, though for me Caleb won 2 of those 3 rounds. Caleb owned Round 1 where they had to perform song choices by 'Idol' creator Simon Fuller. Jena tied that out in Round 2, where they sang a song they previously performed. I would love if Caleb won as American Idol Season 13 winner, but I won't mind if it's Jena, who if ever will be the 1st wildcard finalist to win in the show. As announced by host Ryan Seacrest, American Idol 2014 winner is...Caleb Johnson! Great choice America! I love him since his audition up to the very end. Caleb becomes the 8th male winner of American Idol in its 13-year history, meaning there were only 5 girls who won the title. He's also the 2nd rock singer to win, next to Season 7's David Cook.